RCBO is applicable to electric circuits with rated voltage 230V AC, frequency 50/60Hz and rated current up to 25Amp. The RCBO provides indirect protection to the operator’s body under such situation that the exposed live parts should be connected to a proper earth pole. RCBO is applicable to electric circuits with rated voltage 230V AC, frequency 50/60Hz and rated current up to 25Amp. The RCBO provides indirect protection to the operator’s body under such situation that the exposed live parts should be connected to a proper earth pole. RCBO also provides overcurrent protection to circuits in household, commercial and other similar installations. Moreover, it prevents potential fire danger caused by earth fault current in case overcurrent protection device fails. 1.RCBO with rated sensitivity up to 30mA could beused as supplementary protecting device in case other protecting device faikls its protection against electric shock. 2.RCBO designed for household installation and other similar application, is for non-professional operation, and no maintenance is required. 3.RCBO provides no protection against electric shock from direct contact of both protected lines, or leakage current between these two lines. 4.Particular devices such as surge protective devices, surge arrester ets are recommended to install at upstream line to RCBO as precaution against potential surge voltage and current occurring at its power input side. 5.Satisfying conditions and applications as mentioned above, RCCB with “ON-OFF” indicating device is considered suitable for isolation funciton. 6.RCBO overcurrent protection value is fixed and is not subject to further adjustment. 4.Provides complementary protection against direct contact by human body. 5.Effectively protects electric equipment against insulating failure. 8.Provides comprehensive protection to household and commercial systems. 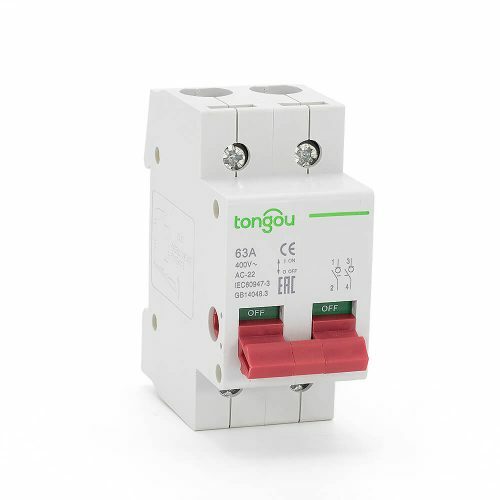 Established in 1993, Tongou electrical focus on the electricity safety products for household, commercial, industrial and similar installations, Such as Miniature Citcuit Breaker (MCB), Residual Current Circuit Breaker(RCCB), Residual Current Circuit Breakers with Over-current Protection(RCBO), Switch-Disconnector, Distribution Box, Moulded case circuit breaker(MCCB), air circuit breaker(ACB), AC Contactor, Magnetic Starter, Motor Protection Circuit Breaker and Thermal Relay etc.